Released May 2007. Roussel’s two most successful works, the ballet Bacchus et Ariane and Symphony No. 3 demonstrate his mature, neo-classical idiom. The Third Symphony, one of a number of works commissioned by the Boston Symphony Orchestra for its fiftieth anniversary season, represents the composer’s neo-classical language at its most incisive. Notable for opening and closing movements which are propelled with unstoppable momentum, this is the only symphony by Roussel to have retained its place in the repertoire. With its unbridled sensuality, subtle harmonies and intricate counterpoint, the sumptuously scored two-act ballet Bacchus et Ariane, is another dazzling display of Roussel at the height of his powers. Stéphane Denève offers follows up his first Roussel disc for Naxos with excellent accounts of these other two wonderful works. The performances are lively and invigorating, with all the sensuous elements brought out fully in the ballet as well as its rhythmic drive. The dense textures of Roussel’s scores can be tricky to capture on CD, but the recordings offer excellent detail within a warm and nicely reverberant acoustic. Listening again to the masterful Third Symphony, one wonders why it is so scandalously neglected in the concert hall. Electrifying debut recording from Stephane Deneve and the RSNO. 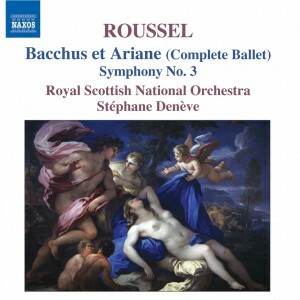 with Albert Roussel’s Third Symphony and the complete ballet music for Bacchus et Ariane. They’ve done them here in concert, but the ebullient freshness of the music still carries a shock. Deneve trounces all the tosh about Roussel’s alleged eclecticism. Folk who cite influences from Eastern music, impressionism, Stravinsky and so on miss the point. Roussel is his own man, and Deneve’s outstanding interpretations underline his stature. The symphony has a wonderful, explosive energy and a slow movement whose close contains music as ravishing as anything in Richard Strauss. Breathtaking.